I first read the title of this book to be “keeper cakes” not “cake keeper cakes,” and while it was my first impression of the title that drew me to it, the overall message is the same. 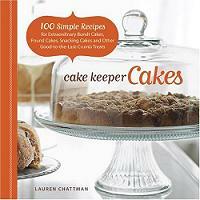 Cake Keeper Cakes is a book about cakes that are simple but delicious, and are the types of recipes that you not only want to make over again, but you might want to make them just to keep around the house. All the cakes in this book are easy to make and not time intensive when you compare them to the cakes in other cake-centric books. There are no layer cakes and no cakes that call for special decorating techniques. Every recipe, however, has tons of flavor and there are lots of wonderful combination used to make these “plain” cakes really stand out. This includes combinations like Chipotle Chocolate Cake, Almond Browned Butter Cake and a Lavender and Lemon cake, in addition to slightly more common flavor combinations. The book is divided up into six types of cake by the type of pan used to make them: snacking cakes (square), round cakes, loaf cakes, bundt cakes, springform cakes and angel/chiffon cakes (angel food pan). With 100 recipes, it will be easy to find things to make even if you don’t have each type of pan mentioned, but since these are basic pieces of baking equipment, you can use the book as an excuse to pick up any pan types you don’t have. Overall, this book is easy to work from and something that would not be intimidating to a novice baker, although a baker of any skill level will certainly find recipes that sound appealing in the book. The recipes are laid out simply, with easy to follow directions and clear ingredient lists. There are some tips throughout the book that hint at variations you can make on some of the recipes, too.Â Many of the recipes are pictured, and the photos are lovely. Fortunately, unlike some books where you can’t visualize what the finished product will look like, the appearance of these cakes is plain enough that you actually can picture them on your own before you try them out. Glad to hear favorable comments about this cookbook. I’ve got it on order from Amazon to go with a lovely glass cake keeper. Hope the bride likes them! Thanks for the review. I’ve been wondering whether or not I needed to add this to my wishlist. Having read your review I decieded to order this book becuase of the way it’s ordered by type of cake, and becuase of the bundt recipes (hard to find here in the UK) and have just spent the morning going through it marking recipes to try – the only problem is going to be what order to do them in! The recipes are laid out simply, with easy to follow directions and clear ingredient lists. There are some tips throughout the book that hint at variations you can make on some of the recipes, too. Many of the recipes are pictured, and the photos are lovely.